Author Kamran Siddiqi notes, “You might know these cookies by the name of palmiers or even elephant ears.” Yep, we can vouch for that. However, he refers to these dainty, diminutive, addictive-as-heck little pastries as “butterfly cookies,” which he says has to do with “evoking sweet, resplendent daintiness.” It’s his God-given right to call this recipe whatever he pleases. 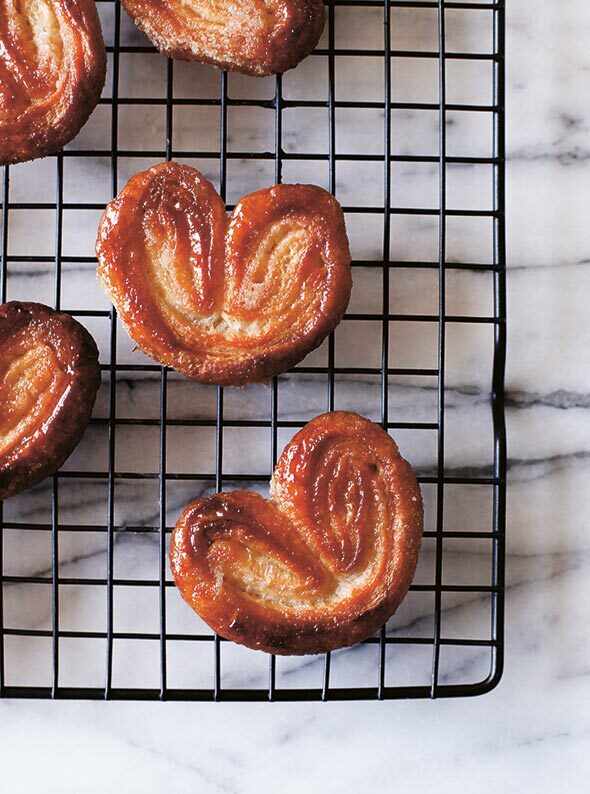 Still, seeing as we’re quite smitten with all things French, to us this recipe for crisp, caramelized, flaky little lovelies will always mean one thing and one thing alone—palmiers. 1. Fold the dough inward so both long sides meet along the center of the dough. 2. 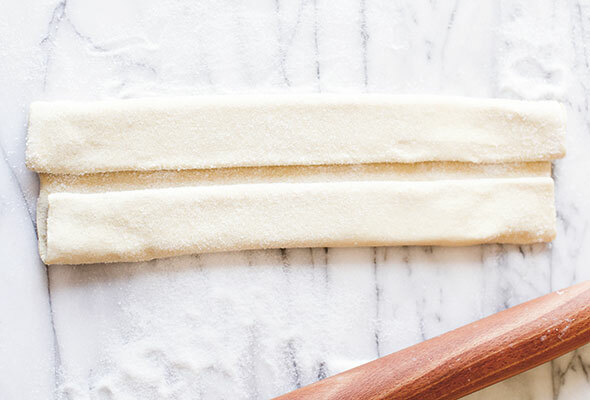 Fold one long side of the dough onto the other, making a long, narrow rectangle. ​3. Cut the folded dough into thin slices. 1. Position a rack in the center of the oven and preheat the oven to 425°F (220°C). Line an 18-by-13-inch (46-by-32 1/2-centimeter) rimmed baking sheet with parchment paper. 2. In a small bowl, mix together the sugar and salt. 3. Pour about 1/4 cup (50 grams) sugar and salt mixture onto your work surface. 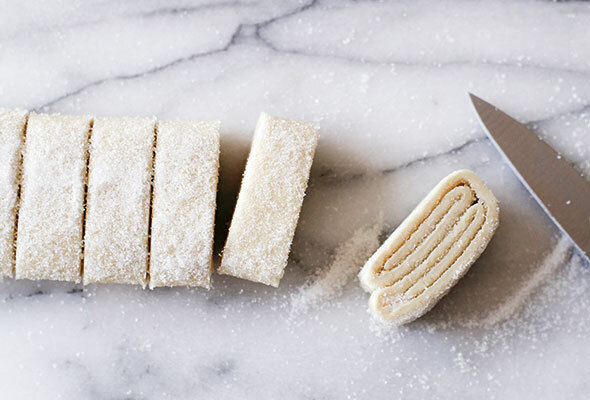 Put the puff pastry on top of the sugar and salt and roll it out into a 10-by-13-inch (25-by-32 1/2-centimeter) rectangle about 1/2 inch (12 millimeters) thick. Sprinkle the remaining sugar on top of the dough and gently run a rolling pin over the dough to press the sugar into it. 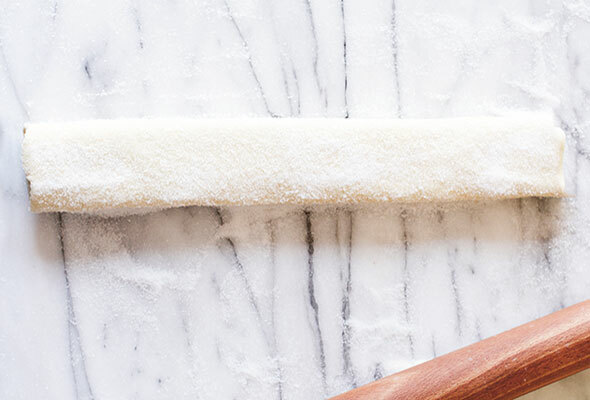 Trim the edges of the dough with a sharp knife to create a neat rectangle. 4. Fold both long sides of the dough inward so they meet along the center of the dough. Then fold both long sides of the dough over once more so they meet in the middle again. Now fold 1 long side of the dough onto the other, making a long, narrow rectangle. 5. Transfer the pastry to the prepared baking sheet and stash it in the freezer for 10 to 15 minutes, just until the pastry has firmed. 6. Transfer the pastry back to your work surface (it’s okay if some sugar remains on the surface from earlier). Using a sharp paring knife, cut the pastry into slices 1/4 inch (6 millimeters) wide and arrange them, with 1 of the cut sides up, on the baking sheet, spacing them about 2 inches (5 centimeters) apart. 7. Bake the palmiers for 12 to 15 minutes, until golden brown. Remove the sheet from the oven, flip the pastries with a thin metal spatula, and bake for an additional 5 to 7 minutes, until the sugar on the palmiers is caramelized on the second side. Trust us, you’re going to want to keep a super close watch on your palmiers, as they go from not quite perfection to pretty much scorched in what seems like seconds. 8. Transfer the sheet of parchment paper and the palmiers to a wire rack to cool completely, if you can resist. Mix 1 heaping teaspoon ground cinnamon into the sugar and salt mixture in the recipe above. Mix 1 1/2 teaspoons store-bought or homemade pumpkin spice mix or 3/4 teaspoon cinnamon, 3/4 teaspoon ground ginger, and 1/8 teaspoon ground nutmeg into the sugar and salt mixture in the recipe above. Easy Palmiers Recipe © 2014 Kamran Siddiqi. Photo © 2014 Kamran Siddiqi. All rights reserved. All recipes and photos used with permission of the publisher. Wow, this palmiers recipe makes treats that are addictive—crunchy and not too sweet and much better than anything you can buy. They're great with a cup of tea or coffee and stay crunchy in an airtight container if you can keep them around long enough. I added some cinnamon to the sugar and would recommend that when you make the recipe. I used 8 ounces Quick Puff Pastry dough. When I rolled my dough out to 10 by 13 inches, it was much thinner than 1/2 inch. It was more like an 1/8 inch. The shaping process was very easy if you know what this cookie looks like. I cut mine to 1/4 inch thickness and got 25 palmiers. They were more like mini palmiers than the large elephant ears you sometimes see. I baked them for 12 minutes, then flipped them and baked them for just 5 more minutes since they were very brown. Be careful not to touch them when you flip them—the sugar is very hot! Also, the palmiers around the edges of the pan were much darker than those in the middle, so I moved them around when I flipped them. To cool the palmiers, I just slid the parchment paper off the sheet pan and transferred everything to the cooling rack. This palmiers recipe works. It's foolproof. In fact, it's so perfect that it works despite every single attempt by this tester to screw it up. See, I ever so smugly tossed the frozen puff pastry in the fridge, delighted I had the main ingredient for this recipe in the house. When I went to roll out the dough, I discovered I had thawed the leftover puff pastry SHELLS from Christmas. Four small circles of pre-cut dough stared up at me from the cutting board, seemingly giggling as if to say, "You, an oven, and sugar have never gotten along..." I gamely rolled out the first circle and followed the recipe to a T. After banging the baking pan in the oven and setting the timer, I went back to glare at the other 3 circles. These I rolled out and used different seasonings—one with cinnamon sugar, another with vanilla sugar, nutmeg, and allspice, and the third one I made savory with cheese and thyme. The timer went off and my first batch had the delicious smell of burnt caramel. I had forgotten to alter the timing in the recipe when my palmiers went from full-size to bite-size. They weren't terribly bad, but there was a distinct black in the swirl. I flipped them anyway and cooked the other side briefly. Then I put in the tray that held all the other flavors and cooked them for half the time on both sides. They were all beautiful to look at and surprisingly fattened up. But the best part was the taste. They were airy, sugary, and perfect. Sweetie pie and I chomped the entire tray in one sitting with a half gallon of milk—we even devoured the burnt ones, which tasted just a bit smoky. Despite my best efforts to ruin this recipe, it's just not possible. Absolutely delicious. A palmiers recipe that calls for puff pastry that's already in your freezer—what a perfect way to use up the puff pastry left over from the New Year's Day pigs in blankets! I've actually made a very similar recipe in the past, but this recipe was better. The high baking temperature makes these caramelize nicely. Admittedly, the caramelization took place much more on one side of the pastry than the other, but I think we can easily correct that. The folding technique provides dainty little palmiers, a nice sweet to have with a cup of tea or coffee. The chilling of the shaped pastry gives you an opportunity to get these prepped and then bake them off whenever you have the time. A few tips: Instead of trimming the edges of the dough with a sharp knife, I found that a pizza wheel makes quick work of that. Follow the folding directions in the recipe carefully, and it is easily accomplished. 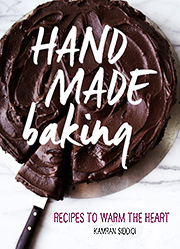 Think of the center line of the pastry as the binding of a book and the pages being folding onto each other. In order to cut the pastry, I found that a paring knife did a perfect job. A baking time of 12 minutes provided the perfect caramelization for the underside of the palmiers. My only problem with the recipe was that once these pastries were flipped, the underside, which was now the top, continued to caramelize a bit too quickly. When I pulled them out of the oven, the other side was a bit paler than I would have liked. Next time, after I flip the palmiers, I will lower the oven temperature. Big word of advice: Make this recipe only when you truly have time to keep an eye on the palmiers while baking. They can go from beautifully caramelized to burnt in just a few seconds. I know this from experience. This palmiers recipe was easy to follow, and the results were quite tasty. I used store-bought puff pastry, which was much quicker than making it by hand. I added a bit of cinnamon to the sugar mixture to give the final product a bit of color. Rolling and folding the pastry was a breeze. The result was ladyfinger-sized palmiers that had a touch of caramelized sugar. Perfect with a cup of tea. I love serving palmiers and often also use them in a savory application as well. Tossing in caramelized onion and Gorgonzola for example. Many thanks for the reminder, Kitchenbeard! We can vouch for them being just as lovely savory as they are sweet. Appreciate it!